The property, which was constructed in the late 1990s, is a two bay steel frame warehouse. The elevations are metal cladding beneath a metal clad roof with translucent roof panels. There is a small concrete loading access to the northern elevation. The eaves height is 6.8m with three electrically operated roller shutter doors positioned at each end of the building. The property is 100% warehouse with no offices or toilets. The site is 1.61 acres, which equates to a site coverage of 40%. To the east of the building is a tarmac area providing 27 car spaces. The property is located on the relatively small St Albans Road Industrial Estate, which forms part of the larger Common Road Industrial Estate. The estate is located a short distance to the north of Stafford town centre. St Albans Road connects with Common Road, which in turn connects with the A513 and on to the M6 at junction 14. 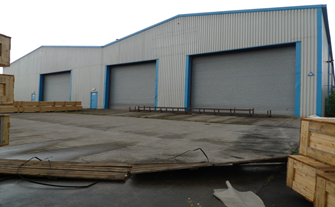 Successfully sold building to a special purchaser whilst still vacant and dilapidated. Tenure: The property is held on a 999 year lease with a ground rent of £2.0 per annum. Successfully sold building whilst still vacant and dilapidated.